Yep, it's the first week of a new month so you know what that means... 'May is ___ month' time. 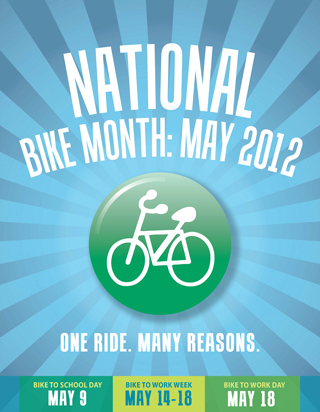 This time it's National Bike Month, fitting since I just got a new bicycle last weekend. Per the League of American Bicyclists, the national sponsor of Bike Month: "National Bike Month is an opportunity to celebrate the unique power of the bicycle and the many reasons we ride. Whether you bike to work or school; to save money or time; to preserve your health or the environment; to explore your community or get to your destination." Though May is 'Bike Month', most activities are centered on Bike to Work Week which nationally is May 14-18 ending with Bike to Work Day on Friday, May 18. In Milwaukee, the Bicycle Federation of Wisconsin (Bike Fed) is organizing Milwaukee Bike To Work Week May 12-18. Check out the website for further details, such as commuter stations (like biking pit stops) or watch for a post closer to the days right here.